Silver Oaks Ranch is a 10-acre, gated estate located just five miles from downtown Kailua Kona and five miles from Keahole airport at a cool 1400 feet elevation. Although less than 10 minutes from downtown, we are nestled among large estate properties, offering peace and tranquility combined with panoramic, unobstructed, views. From Kona airport to the north the view sweeps for over 40 miles, through downtown Kona, past the Mauna Loa ridge to the south and wraps around with a view of Hualalai Volcano above the town. There are very few properties that command as wide a view and as unobstructed a view so close to everything. Only five miles from the ocean, enjoy the beach until you are too hot and then cool off and relax up at the Ranch. 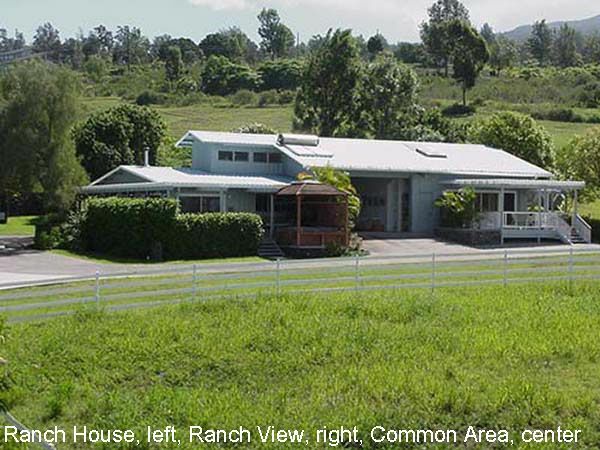 The property combines native and non-native Hawaiian landscaping with a variety of fruit trees on the upper section, and rich pasture land that sweeps down to a 6-stall barn and large arena on the lower section. We are a working ranch and raise chickens, Nigerian Dwarf dairy goats, and miniature donkeys and have a retired Arabian show-horse. Our largest cottage, the Ranch View, is a 2-level, high ceiling, one bedroom, with full kitchen and second, loft bedroom designed for children. Our list of amenities is unsurpassed and includes everything from complete snorkeling gear, binoculars, coolers, boogie-boards, beach chairs, computers, backpacks, umbrellas, books and videos. Our cottage's kitchen has been called 'as good as home'. Please see our web site on the links section or google us. Silver Oaks Ranch was purchased by Richard and Amy Decker in 1997 after we retired from the mainland. Our dream was to live the quiet peaceful life on a farm in Hawaii! Both of us retired from the Silicon Valley computer industry and love living the quiet Hawaiian life. We bought this property originally to raise horses. It is on 10-acres away from the hustle and bustle of town. It is also at a nice cool elevation and about 10 degrees cooler than downtown Kona. Yet we are only a 10 minute drive to downtown. We fell in love with this property due to the sweeping views. Once you are on the property, the views are spectacular! Pool and Jacuzzi on property! Silver Oaks Ranch offers panoramic views. From Keahole airport to the north, your view sweeps for 40 miles, through downtown Kona, past the Mauna Loa ridge to the south and finishes with a view of Hualali Volcano above the town. We loved our stay at Silver Oaks Ranch in Kona Hawaii. The ranch was a lot of fun to stay in. Great views, lots of room, great hosts. Fully equipped kitchen, great deck, everything we needed and more. Silver Oaks is an ideal setting for anyone wanting to visit Hawaii. The hosts are wonderful, the facilities are great and the location is easily accessible to all the Big Island has to offer. Amy and Rick are just outstanding hosts. First time to Hawaii was great, we would stay at Silver Oaks again! Thanks guys! Hope to see you again in the future. Mahalo! Wonderful as a quiet and picturesque retreat a few miles from Kona, ranch-setting with some farm animals; not a lot of glitz but spacious with all the comforts of home, plus very friendly and helpful hosts. We thoroughly enjoyed our 6 night stay at Silver Oaks.All our needs were met by our gracious hosts. Thank you Rick and Amy for making Silver Oaks such a welcoming place. It is situated above Kailua Kona, with nice views of the ocean and sunset. Nigerian goats are always a kick. :) and there were plenty to enjoy, along with the wild turkeys, donkeys, chickens (yay fresh eggs) and numerous birds. Hot tub was great, lanai is spacious as is the cottage itself. We had a great time. Amazing, beautiful and very relaxing with all you'll ever need! Rick is a great host and gave us a great overall rundown of the property and all the amenities. The property is fully outfitted with everything you could possibly need. Clean and well cared for. Beautiful view and a few cute farm animals to check out if you like. Close to town and very convenient, yet far enough away to be out of the huddle and bussle of the city. We stayed at Silver Oaks Ranch, in the Ranch View Cottage, for six nights in February 2016. The property is beautifully situated on a private road high up above Kailua Kona with wonderful views of the coastline and surrounding countryside, which can be enjoyed from the large private Lanai of Ranch View. There is a lovely pool by the main ranch house which Rick and Amy are happy for you to use, which also enjoys the same views. The cottage itself is extremely well equipped with everything you could want during a vacation to the Big Island, full kitchen, spacious living/dining room, high quality linens and a thoughtful welcome box of macadamia nuts. There is beach and snorkel equipment, which you are welcome to borrow at any time and Rick is happy to advise on the best beaches to visit in order to see Turtles and Manta Rays. The property is a real home away from home in an idyllic, quiet setting, yet only a few minutes drive from both Kailua Kona and Kona Airport. The owners are very friendly and helpful, offering advice and assistance when required however we were particularly impressed with the way in which they treated their guests as responsible adults who didn’t need to be over supervised, allowing you to enjoy your time at Silver Oaks in the way you choose. We would definitely recommend this property and intend to return to it ourselves. Silver Oaks Ranch is a 10-acre, gated estate located just five miles from downtown Kailua Kona and five miles from Keahole airport at a cool 1400 feet elevation. Silver Oaks Ranch offers panoramic views. The property contains two spas and a pool. We are a working ranch and raise a wide variety of chickens, Nigerian Dwarf dairy goats, and miniature donkeys, and have a retired Arabian show-horse. Rates are based on double occupancy. We do charge an extra person charge of $20 per extra person per night for more than 2 people.